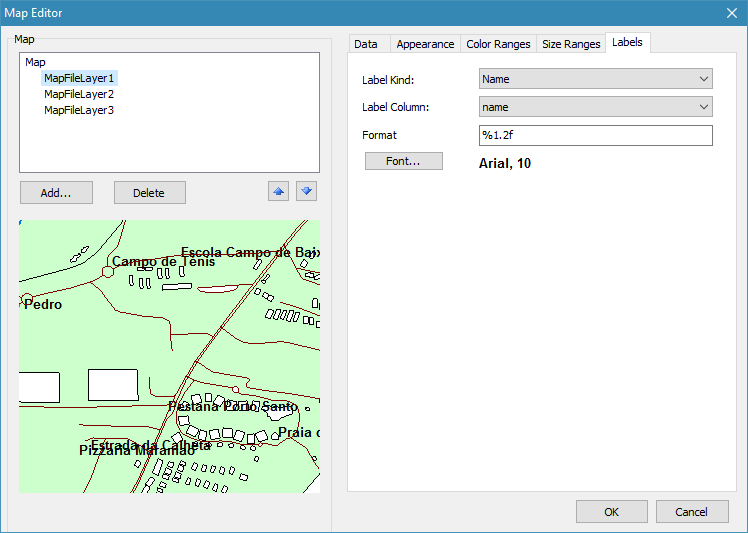 How to use interactive maps in FastReport VCL 6 - Fast Reports Inc.
Interactive maps have become very popular with the appearance of Google Maps. They allow you to navigate the map, zoom in and out, and many other functions. With the release of FastReport VCL 6, such maps can be embedded in reports. 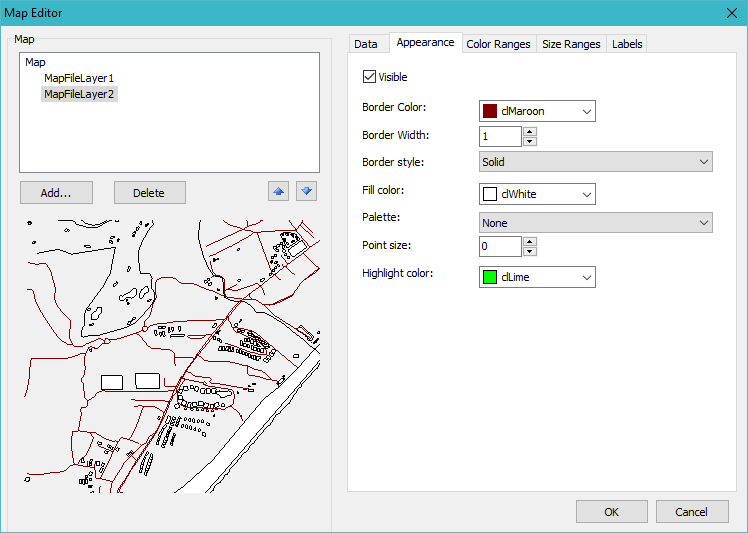 To do this, you must obtain a map in one of the two available formats and insert it into the report using the Map object. 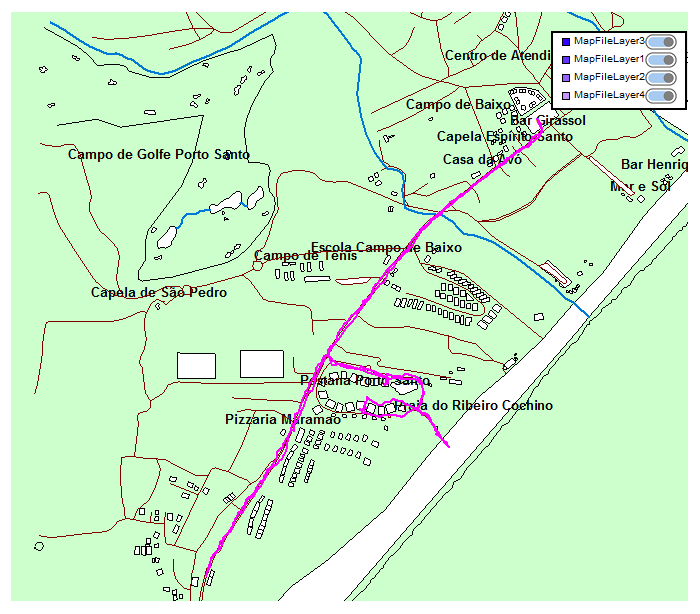 You can use maps in .shp and .osm format, and gps tracks in the .gpx format. The .shp - ShapeFile format. This is a special format for storing vector geoinformation data. It was developed by the American company ESRI in the 1990s. 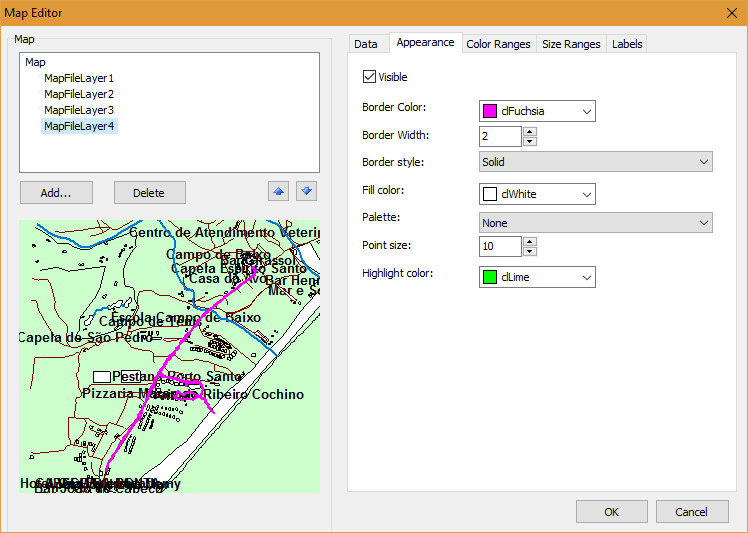 Currently, it is the most commonly used format in Geoinformation systems. Actually ShapeFile is not a single file. In addition to the .shp file, the set also includes .shx and .dbf. The first, .shp, is a geometric description of the figures. The .shx file has a positional index to bind the shapes to each other. The .dbf file contains information about the shapes from the .shp file. Since this is a commercial product, some maps may be chargeable. The .osm format is OpenStreetMap. This is a geographic data storage format based on xml. From the title it is clear that this is an open project, which is supported exclusively by volunteers. This web project is a global map of the globe. Volunteers are constantly replenishing the map with new geolocation data, aerial photographs. The project has become very popular and has a huge number of participants. Therefore, the details of the maps are at a sufficiently high level. All maps in osm, as in shp, are presented in a two-dimensional format without displaying altitudes above sea level. Since the project is free, the maps are also free. First of all we need a map. 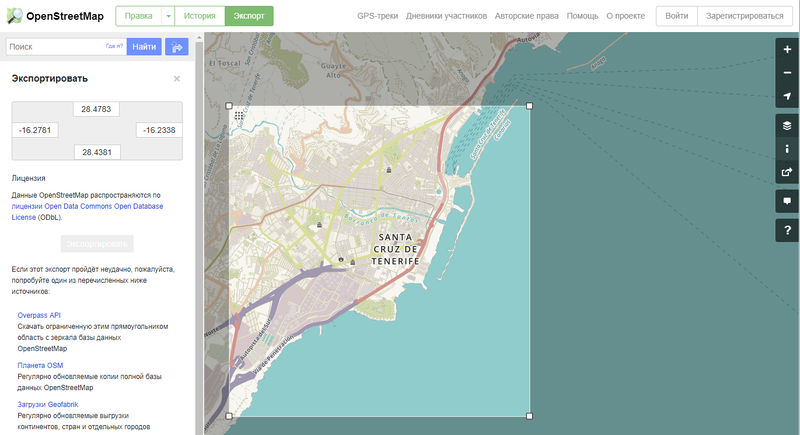 The Map object supports three file formats: .shp, .osm, .gpx. The first two represent vector maps, the latter - a set of routes and tracks for maps. 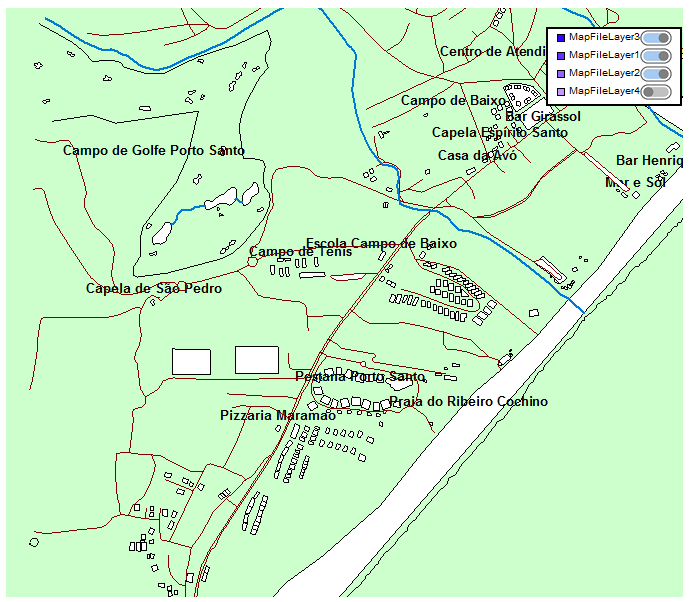 You can download the map in one of the available formats, and then, in a new layer of GPS data. Before considering the Map object, let's determine where to get these maps. You can download ready-made maps on the Internet. A lot of sites provide both paid and free maps in both formats. By clicking the "Export" button, the browser downloads the osm file. So, if you need to show a small area on the map, this service will be very helpful. 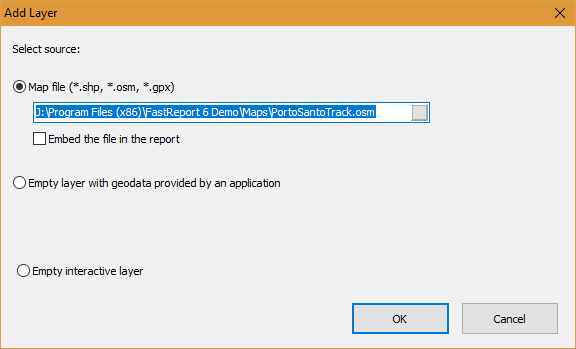 If you just want to experiment, like me, then you can take the finished files PortoSantoTrack.osm and PortoSantoTrack.gpx from the FastReport VCL 6 delivery. Create a report. And add a Map object to the page. By the way, you can place this object on any band, except for "Data". After adding an object, we will immediately see its editor. For now, the object is empty. We see only: general settings, color scale, size scale. The map consists of layers. You can display the entire map in one layer, or divide it into several layers. In the case of dividing the map into several layers, each layer can be adjusted separately - color, font, line thickness and so on. With the help of different settings for layers, we can, for example, paint the rivers in blue, and the roads in red. 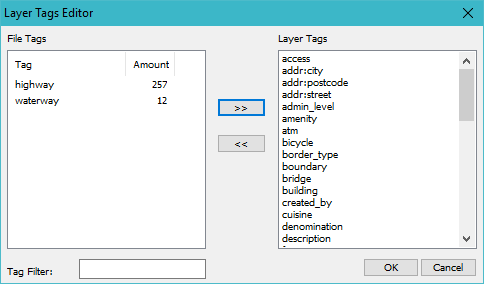 Map objects are described by tags in an XML (OSM) file. 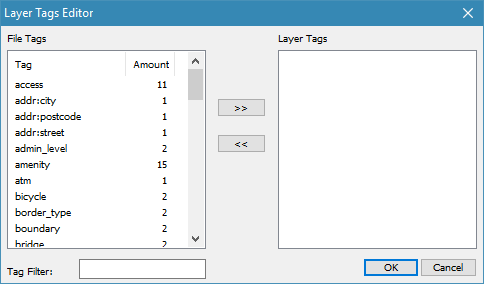 In each layer, we select the tags (objects) that we need for the display. 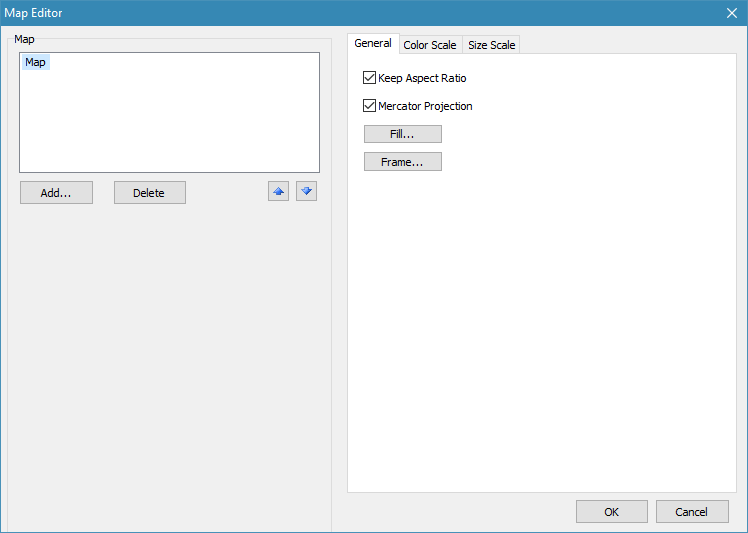 Then, in the layer settings, set the parameters (color, font, thickness, etc.). So, the layered map allows us to customize the display as desired. 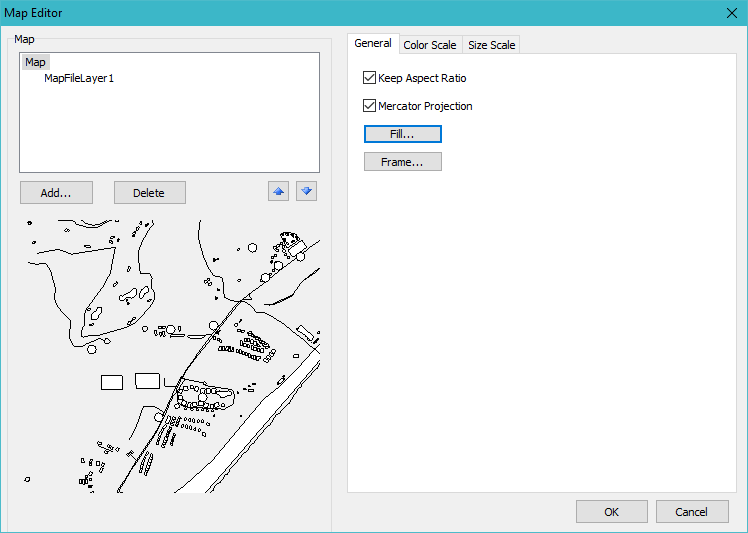 In the case when you display a map in one layer, the settings are applied to all map objects and you can not adjust the display of its individual elements. Here it is necessary to say that for maps in the .shp format, only one layer is visible. an empty interactive layer - as I understand it, it's not yet implemented functionality. It is possible to create a layer manually using primitives. Now, attention! If you click Cancel, all tags for this layer will be automatically selected. But we are going the other way. There is a filter for the tags below. • Labels - label settings. Add one more layer in the same way as before. This time we will select only the highway tag. On the Appearance tab, change the Border Color to Maroon. Now the roads have the maroon color. Add the third layer. This time, select the waterway tag. Change the Border Color for water objects to blue. And set Border Width to 2. In the Map settings, set the fill. Some pastel color. There are not enough labels. Choose the first layer. On the last Label tab, select Label Kind for Name. And for the label column - the name value. We added the map, let's see now what the gps track looks like for this map. 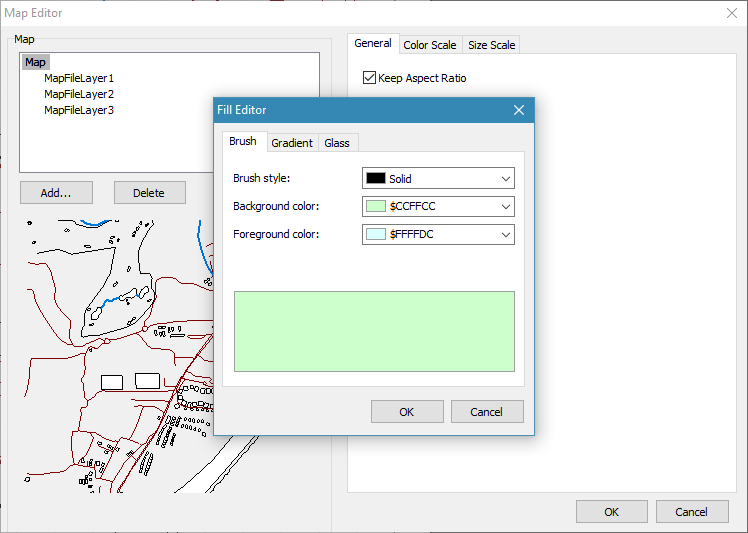 Add one more layer and select the file with the extension .gpx. That's all. I agree, there are some difficulties with adding a map by layers. You have to add manually the necessary tags to the layer. But, then, the result is much better than adding all the tags in one layer.